How in the blazes did we miss out on this one? The head in the red circle there belongs to Vithaldas Hegde. He is presently the chief reporter for the Gomantak Times. His head (we are extremely sorry you cant see him clearly, but it wasn’t a great picture. What you have missed out there is a shock of wavy hair and a patch on the top of the head, where the sunlight filters through easily to the scalp). 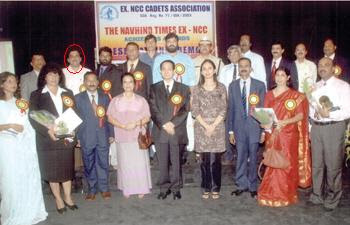 Hegde is here in this photograph cause he is being awarded The Navhind Times ex NCC achievers award for meritorious service and outstanding achievement. We pricks are not very sure about what exactly Hegde’s contribution has been to the media. A less than ordinary journo he is more known for his association with the guys like Milan Burman and bigger fish like Churchill Alemao. And poor chap is still not in the ‘League of Extraordinary Journalists’ who prop themselves up with the notorious ‘senior journalist’ crutch. Does he look out of place here? What sort of guys does he share the award with?… Deputy Superintendent of Police Mahesh Gaonkar? MERITORIOUS SERVICE? He services politicians, that’s about it… And who else Atmaram Nadkarni, the former advocate general… need more be said about him? Also seen in the photograph is the eternal jack-in-the-box John Aguiar… One of the few government servants to have Manohar Parrikar on his Orkut friends list. And there Jamir… the governor… We don’t blame you, if you can’t see him… We too were almost blinded by Ms Pallavi Dempo’s shiny pants. At the risk of being in the minority, an oddity or even being politically incorrect, I say that Vithaldas Hegde's articles are my favourite, along with those of Mr. Aravind Bhatikar, Dr. Joe D'Souza and former Gomantak editor Mr. Sujay Gupta. Hegde has excellent analytical skills. He does his homework prior to an interview. There is a lot of depth to his work. As far as awards are concerned, all you need to do is get a medal/award from some bloke at the local level. Based on that you go higher up, culminating with the President's award ...he he he. Each award is based on the lower one. Today is I Day. I think medals are distributed... or is on R day? Anyway I don't necessarily envy someone with a medal. If you have the time, get a hold of Gomantak Times, August 11, 2007 edition. See the article "Menon's appointment challenged" (Under Fire? )on page A3. Read in between the lines to see how system can be manipulated to propel you to the top.